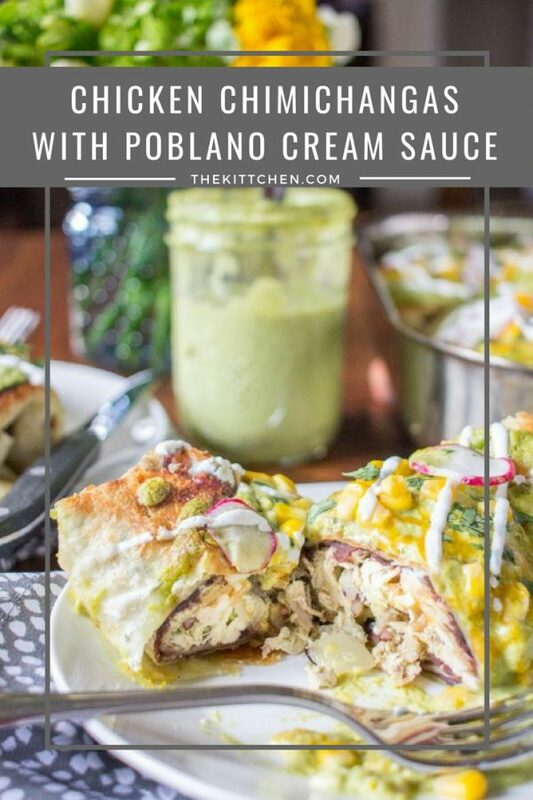 These chicken chimichangas with a poblano cream sauce are a delicious dinner that your family will ask for again and again. 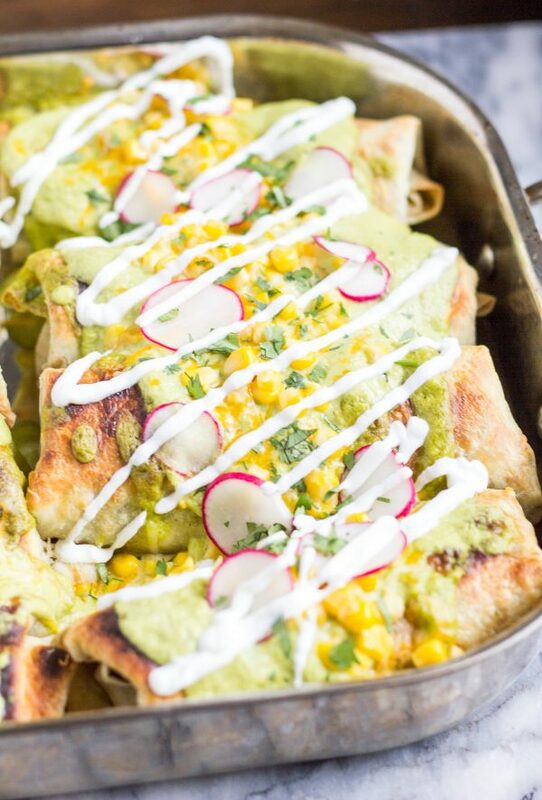 Kansas City: go for the barbecue, stay for the chimichangas. It should basically be the city’s slogan because the Mexican food at Port Fonda is that good. I recently spent a weekend in KC as part of a press trip organized by Visit Kansas City and was blown away by the food. It was my third time in Kansas City, but this was the first time I explored restaurants beyond the city’s world-famous barbecue joints. The press trip focused on showing us the city’s hidden gems, one of which is Port Fonda. If Port Fonda was in Chicago there would be a permanent line to get in. The food is exceptional. 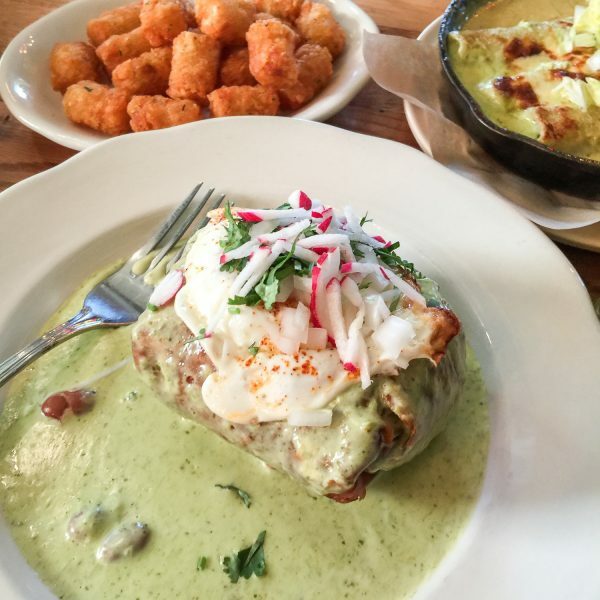 We went to Port Fonda for brunch, and I was told to order the restaurant’s signature item, the chimichanga. Chicago has a serious shortage of places to get a chimichanga, so I was immediately excited. I love chimichangas, and I hadn’t had one in years. At brunch, the chimichangas are served with a fried egg on top. 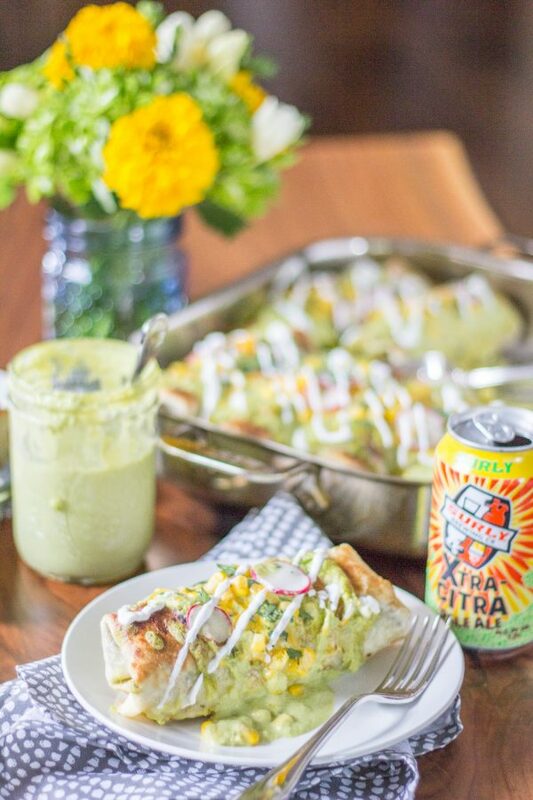 Charles jokes that I am always saying, “This would be good with a fried egg on top” so obviously I was excited about this brunch version of a chimichanga. 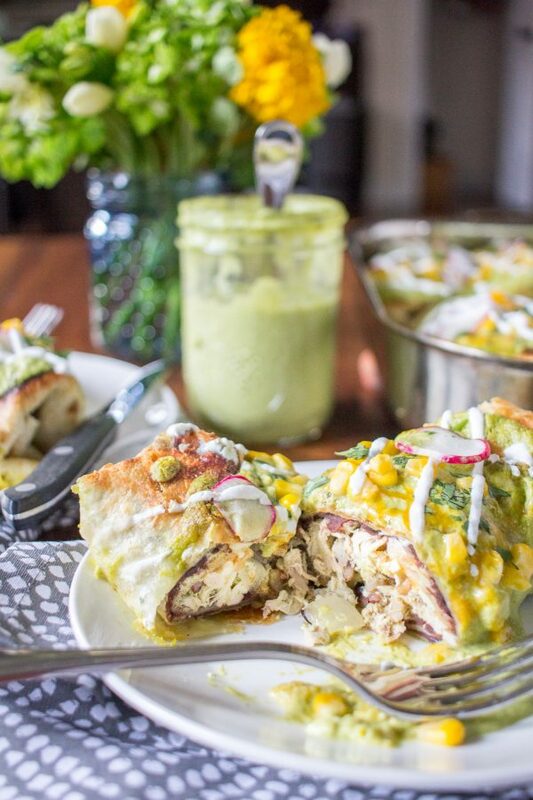 This chimichanga is a pretty close re-creation of the chimichanga at Port Fonda. 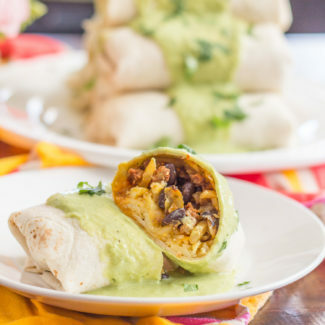 It is stuffed with refried black beans, shredded chicken, rice, and cheese. 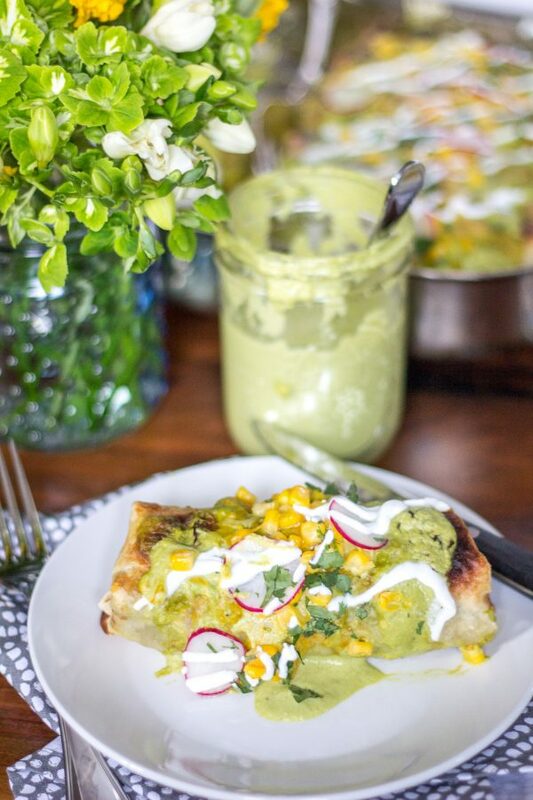 It is served topped with a poblano cream sauce, cheese, radish, corn, and cilantro. The chimichanga I had at Port Fonda had both chicken and beef, and it was fried. 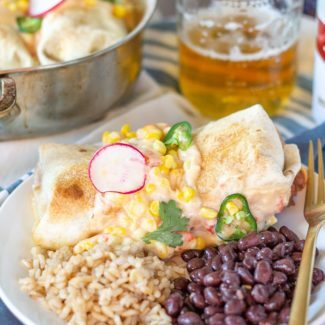 I wanted to keep things simple so I only added chicken and I baked the chimichangas so that I could make a large batch all at once. 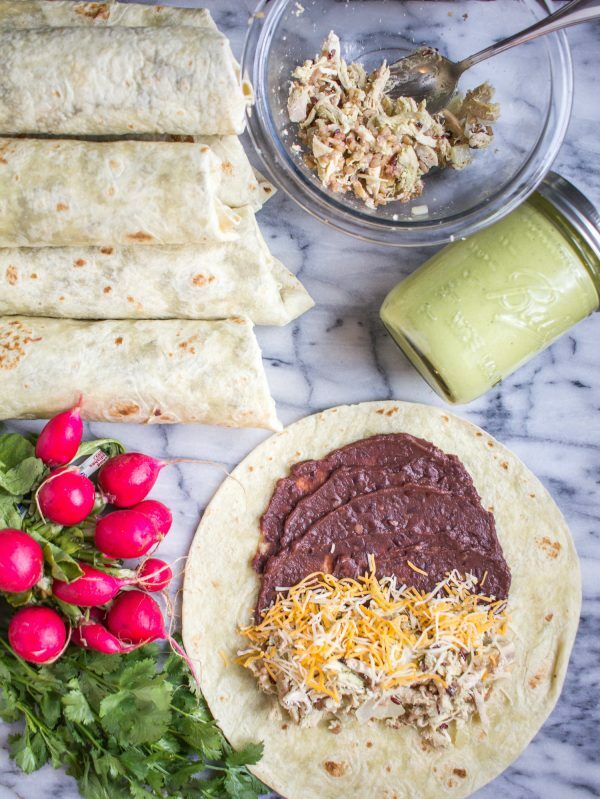 To save time I used a rotisserie chicken in this recipe. Using store-bought rotisserie chicken is my favorite time-saving hack. For the rice, I used Uncle Ben’s microwavable rice since it is quick and mess free. 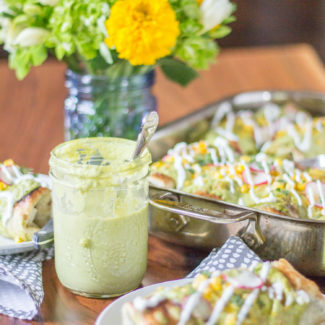 Thanks to those two shortcuts, the active preparation time for this recipe is just about 30 minutes, you just need to make the poblano cream sauce and assemble the chimichangas! First, prepare the poblano cream sauce. Start by roasting the poblanos. I like to put the peppers directly over the flame of the gas burners, rotating them until all of the skin is charred. Then I place the peppers in a covered bowl for 15 minutes. This lets the peppers sweat off the skin a bit, and gives them time to cool. After 15 minutes peel off the skin, and loosely chop the peppers. I recommend discarding the seeds, unless you want an extremely spicy sauce. Next, melt the butter in a saucepan over medium heat. Then add the garlic and onions. Cook until the onions are translucent. Set aside half of the onion and garlic mixture, you will use this to season the chicken. Then add the chicken broth and heavy cream. Bring to a boil, add the poblanos, and let boil and reduce for 6 minutes. Pour the poblano mixture into a blender and liquify. Season with salt, pepper, and cumin, and add 1/2 cup sour cream. Blend to combine. Add more sour cream and salt to taste. Pour the shredded chicken into a bowl, and add in the remaining onions and garlic, 1/2 cup of the poblano cream sauce, and the rice. Stir to combine. Now it is time to assemble the chimichangas. First, heat your oven to 350 degrees. Place a tortilla on a work surface and spread 2 heaping tablespoons in the center of the tortilla and going up to the top edge. 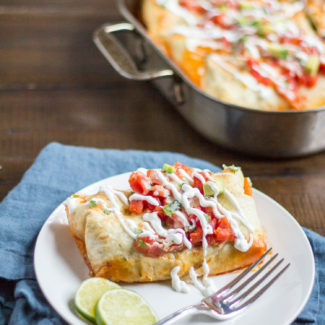 The refried beans function as glue to hold the chimichanga together, so you want some on the top edge. 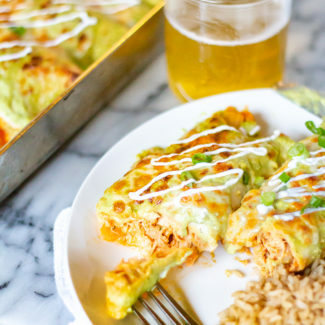 Place a heaping 1/2 cup of the chicken filling in the middle of the tortilla, top with 2 tablespoons cheese, and then fold it up burrito style and place in a baking dish. Repeat using all your ingredients. Brush half of the olive oil over the chimichangas. Let cook for 25 minutes. Then increase the heat to broil letting the chimichangas brown, this will take about 2 minutes. Then remove from the oven, flip the chimichangas, top with the remaining olive oil, and then brown the second side under the broiler. 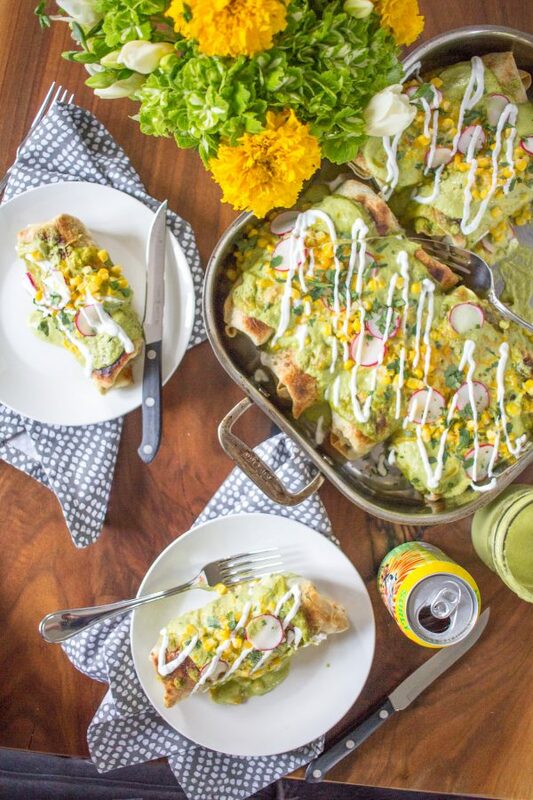 Heat 1 1/2 cups of the poblano cream sauce, pour it over the chimichangas, top with cheese, corn, radish, cilantro, and sour cream. Serve right away. 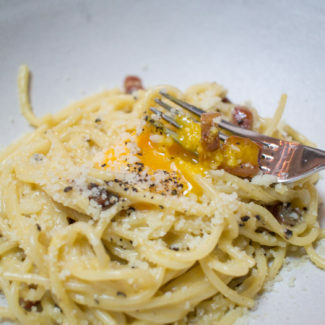 If you want you can add a fried egg on top!